It’s only a short update blog this week, but a pretty exciting one, all the same! This week has been all about the Deathwatch once again, mainly a lot of building, but also a lot of tiny details on the veterans! I’m pretty sure these are about as good as I’ll be able to get them now, but I’m really happy with them, I feel! 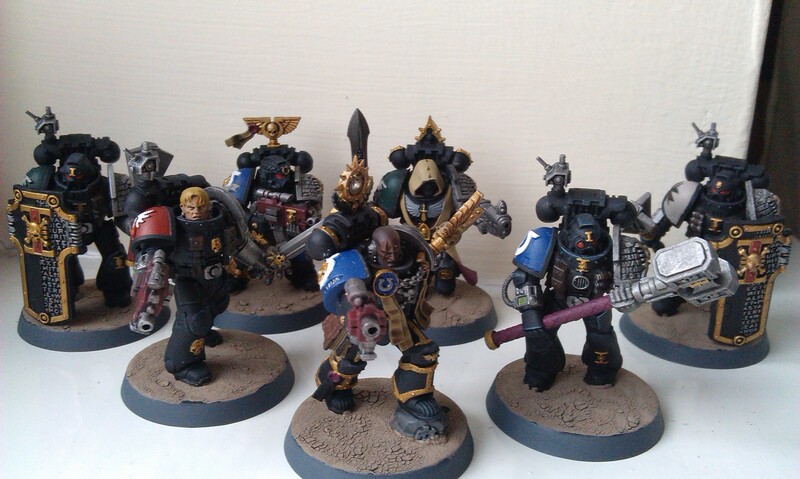 The bases have been done to match the rest of my space marines, which I think has helped off-set the black armour really well. I’m not entirely sure about the Blood Angel face, there – the hair is pretty much the GW scheme of XV88, Balor Brown and Zamesi Desert, but the face is just overbrushed Cadian Fleshtone. While the technique worked well on the Chaplain figure in the foreground there, it hasn’t really worked as I’d hoped with the Caucasian scheme. Ah well! I’d almost forgotten I’d built a venerable dreadnought! I’ve been working on the golden bits, which I feel really helps to define that Deathwatch look on these things, having previously drybrushed the corners of the armour with Dark Reaper. I feel there may not be quite so much work to do on this guy as I’ve been thinking, just the odd silver or red detail to draw it into the overall scheme. The Blood Ravens psyker might take a bit more work of course, but I’ve enjoyed doing these chaps so far, so hopefully I’m practiced enough now that it won’t be too long! But what was that about building, you say? Oh yes, I got myself a Corvus Blackstar! I’ve previously only built up one flyer, the Necron Doom Scythe, which remains in a semi-basecoated state, so I should really try to get more done there. Anyhow, the Blackstar is a lot bigger than I’d expected, and took three evenings to build, in the end. I decided to forego the small details like the hurricane bolters and the air brakes, and just have a really sleek vessel in flight, which I think looks pretty fantastic, I have to say! There’s an awesome piece of artwork that shows the Blackstar in action, but sadly it can’t be built in such a dynamic drop-pose, so I think it’s fine like this! Next Next post: To Kaladesh – and beyond!